France and Spain will play off in the final match of the youth basketball international tournament in Poinçonnet for the title. Both teams are undefeated after crushing their opponents on the second day. Spain beat Poland (87-58). The game was over as a contest by the end of the first quarter with Spain leading (31-10). Spain were never in danger despite an evenly contested second and third quarter before finishing with a flourish in the final quarter. Deborah González had another perfect shooting day for Spain going 4-of-4 for 8 points in nine minutes. However the player of the match was Marles Balart with 11 points, 8 rebounds and 4 assists, while Elena de Alfredo (left) led the scoring with 14 points. For Poland Dominika Miloszewska was the best player in the match with 9 points and 12 rebounds in just under 20 minutes of play. Dominika Owczarzak and Malwina Rudzka led the team scoring with 15 and 11 points each. Spain: Deborah González 8, Rocío Torcal 2, Patricia Soler 3, Elena de Alfredo 14, Gala Mestres 3, Marta Montoliu 8, Laura Marín 12, Belén Arrojo 0, Laura Aliaga 12, Ana Carlota Faussurier 13, Laura Correa 2, Marles Balart 11. Poland: Monika Skrzecz 2, Malwina Rudzka 11, Dominika Owczarzak 15, Julia Drop 3, Maja Rynkiewicz 4, Julia Adamowicz 0, Daria Marciniak 3, Wioletta Wisniewska 0, Dominika Miloszewska 9, Karolina Puss 5, Katarzyna Jaworska 4, Beata Jaworska 2. What a difference a day makes: Belgium were more aggressive, hitting their three-pointers and giving France a tough time. 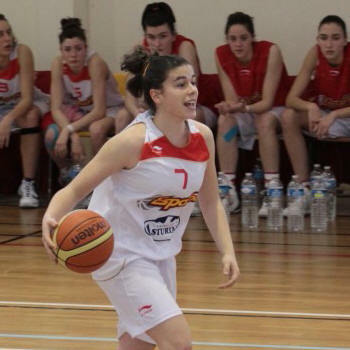 The Belgium team relied a lot on Antonia Delaere who had a good game leading her side with 20 points and 4 assists. Unfortunately her performance was littered with a lot of turnovers. Belgium had the better of the first half and led (37-34). Olivia Epoupa was the driving force for France. She was everywhere and finished the game with a double-double of 20 points and 10 steals. She also had 3 assists and 7 defensive rebounds. It was not all perfect as she clocked up 5 turnovers. However her energy was infectious and with Valériane Ayayi (right) scoring 25 points France were able to pull away late in the third quarter before dominating the final quarter to win (81-65). France: Marième Badiane 8, Céline Pfister 3, Lidija Turcinovic 3, Olivia Epoupa 20, Mamignan Toure 8, Awa Sissoko 2, Imane Brahmi 0, Valériane Ayayi 25, Lisa Cloarec 4, Axelle Koundouno 2, Aby Gaye 6, Assitan Kone 0. Belgium: Antonia Delaere 20, Nette Van Oeckel 0, Hind Ben Abdelkader 6, An-Katrien Nauwelaers 0, Saar Bogaert 9, Janne Roggemans 0, Heleen Adams 14, Jolien Goyvaerts 0, Josephine Anseeuw 1, Camille Lebrun 2, Jille Van Meerbeeck 3, Malon Humblet 10, Axelle Bernard 0. This generation of French players had lost to Spain (55-76) during the 2009 U15 partnership tournament. France, Greece, Italy and Spain have had U15 tournaments since the summer of 2007.